Two men, each handsome and unusually adept at his chosen work, embodied an element of the great dynamic that characterized America’s rush toward the twentieth century. The architect was Daniel Hudson Burnham, the fair’s brilliant director of works and the builder of many of the country’s most important structures, including the Flatiron Building in New York and Union Station in Washington, D.C. 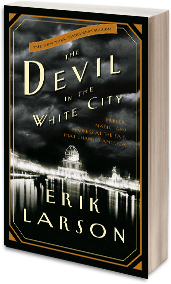 The murderer was Henry H. Holmes, a young doctor who, in a malign parody of the White City, built his “World’s Fair Hotel” just west of the fairgrounds—a torture palace complete with dissection table, gas chamber, and 3,000-degree crematorium… What makes the story all the more chilling is that Holmes really lived, walking the grounds of that dream city by the lake. To read more about this book on Goodreads, click here.